It is amazing how racism and national oppression make us yearn insatiably for validation and affirmation. While realizing in the first place we must implant those aspects of self-identity and esteem internally, we still look externally for reinforcement. Too often, that reinforcement is woefully absent in this society. Too often, Hollywood acts as if it does not have a clue. Every now and then Hollywood reveals quite starkly that it knows the truth, which merits being told. Racism and national oppression leave a hole in our soul huge enough to make us startle at the intensity and passion with which we can become enthralled in a Hollywood movie which makes no pretense at not knowing how to do the right thing. It makes you wonder why Hollywood doesn’t do the right thing more often. 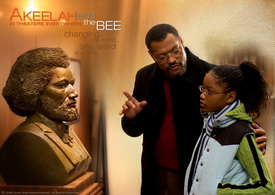 “Akeelah and the Bee” is proof that Hollywood does know how to do the right thing. It is an imaginary story in which Laurence Fishburne and Keke Palmer are magnificent, and J. R. Villareal as Javier is delightful. Fishburne is an actor on par with the greatest actors of all time. There are a few moments in this film when his superb ability is called upon, and he delivers ever so humbly. It is very interesting to watch Fishburne portray the character of Dr. Larabee because we usually see him in roles which allow him to project omnipotence. Fishburne’s character in “Akeelah and the Bee” is a very well educated college professor, but he suffers from a debilitating pain which he struggles very hard to manage. The movie does not consume itself with examining this aspect of the character, but Fishburne conveys the depth of the emotional problem to the audience through his superior acting ability. Palmer is a joy to behold. She captures the contradictions of the character of Akeelah and pulls the audience into her struggle to realize her right to be. Angela Bassett’s character is less developed, though meaningful, in the angle presented of the single (widowed) Black mother struggling with her children in a less than affluent part of Los Angeles. Her piercingly intense confrontations with her children allow us to learn not enough about who she is and how she came to be, but the movie does at least convey that she cares and cares deeply. The movie actually lets you yearn to know more about most of the characters which is an element of what makes it work. You walk out inspired and willing to at least think about conquering the demons which constantly tell us, if not disputed, that we are undeserving. “Akeelah and the Bee” contributes to our collective knowledge of the need to reject those fiends. Take your children, neighbors, church and union members, students, and any and everyone else you know. Adults of all ages, adolescents and children will be exposed to a lesson worth watching.